2017 was a tough year for the circus. After 146 years of performances, with Washington, DC as an annual stop, Ringling Brothers called it quits. And the more intimate Big Apple Circus filed for bankruptcy, after entertaining audiences of all ages for nearly four decades. But thanks to a retired surgeon, Dr. Neil Kahanovitz, Big Apple Circus is back, and opening at National Harbor March 8 through April 1. 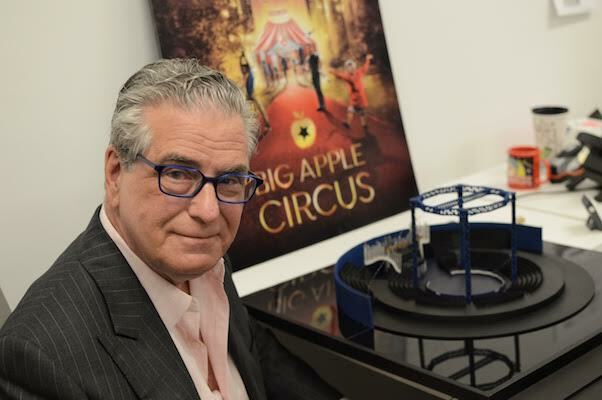 Dr. Kahanovitz and a team of investors rescued Big Apple Circus, buying it out of bankruptcy in February 2017, and arranging its successful opening this fall in New York at Lincoln Center and its 40th Anniversary Season and National Road Show. Kahanovitz’s love for the circus dates back to when he was a toddler, growing up in Baltimore. At age four, his mom Bettie, took him to see his first circus. During his elementary school days, he became a voracious reader of anything circus-related, not able to get enough of books related to clowning and the magical life of circus performers. At the young age of eight, Kahanovitz built his own trapeze in the backyard, using a broomstick and two pieces of rope. But Kahanovitz’ love for the circus never faded, as one day en route to high school, he and a friend passed the arena in Baltimore where Ringling Bros. was setting up. Having been to dozens of hockey games at this same venue, Kahanovitz was mesmerized by its transformation, trapeze swings, tight ropes, and tigers. Kahanovitz’s parents, Jake and Bettie, had other plans for their only son, which did not include running away with the traveling circus, but rather going to college and medical school. And so began these dueling, divergent dreams and career paths, one as a trapeze artist in the circus; the other as an orthopedic surgeon. Luckily, Kahanovitz has been able to pursue both passions. One summer while in college, he landed a job with Clyde Beatty Cole Bros Circus selling concessions. And while attending the University of Maryland School of Medicine, Kahanovitz took a leave of absence to perform in the comedy trampoline act and later as an aerialist in a large circus in the Midwest. Kahanovitz went on to a distinguished medical career, including serving as head of Spine Surgery at our very own Washington Hospital Center for more than a decade. He has published been over 50 articles in scientific journals, written about spinal disorders in medical textbooks, and authored a book on the treatment of lower back pain. He has served as President of the North American Spine Society and has received the prestigious Volvo Award for Low Back Pain Research, as well as a Commendation from The United States House Physician’s Office for his care and surgery performed on members of the United States Supreme Court and Congress. He was also awarded one of the Soviet Union’s most prestigious civilian honors, The Order of The Supreme Soviet Medal of Personal Courage, for organizing relief efforts following a devastating earthquake in Armenia. Now in retirement, Kahanovitz has thrown his hat back in the ring. According to the good doc, “I’m not the kind of guy who would look forward to a quiet day on the porch.” So, rather than assuming a low-key lifestyle, this 68-year-old former surgeon has taken on a new challenge in retirement: saving the centuries-old art form of the circus to ensure that current and future audiences can experience the thrill and delight of live and daredevil human acts in the intimate atmosphere, where no seat is more than 50-feet from the action, all under the Big Apple Circus Big Top.